Or so that's what I've started calling one corner of my desk. 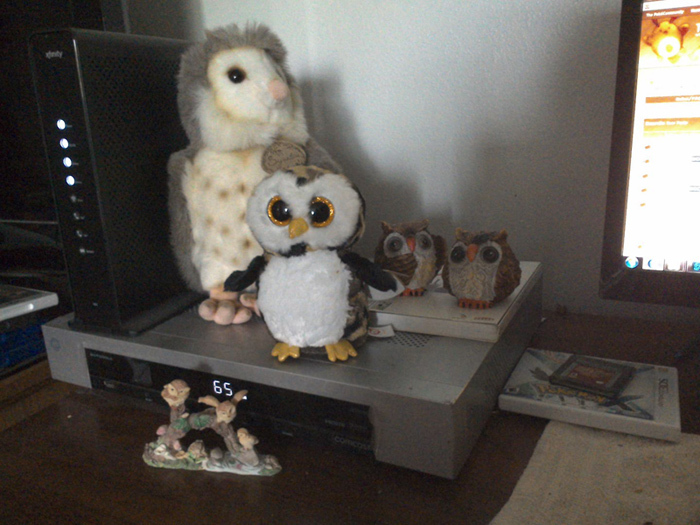 As I realize I definitely have an owl collection going now after I picked up that little plush guy in front the other day on a whim. What can I say, I passed over a pink koala in that same style but I saw the owl and was like NOPE. I AM BUYING. CAN'T STOP ME. Hello blog, been a while since I've talked to you! So I'm actually writing this the day after said day in title (in my time zone anyway), but that's pretty much because I was gone the entire day and was way too tired after to do much. Whoops. So I had a computer of mine die in 2006. While the computer itself went back to Dell whenever they sent me my current laptop, I still kept the hard drive and all the stuff on it - but just couldn't access it because I had nothing around here it would fit into. We currently have a computer that it does fit into, apparently. All my old music. All my old artwork. Stuff I'd forgotten I had or made, since I haven't been able to get to it for a few years. So for those that don't know me, I've had a horrible track record with computers. Every single summer (or close to it), for the past few years, I've had a computer die on me in some way. - July 2003, the hard drive in my old old desktop crashed. - May(?) 2004, the same desktop finally gave up the ghost entirely (though the hard drive was okay, and I think is still being used in one of the computers in this house). I have this blog. What shall I ever do with this blog?? Work's been interesting lately. I have to wonder just how more interesting it'll become, especially if I can get a transfer request put through.